Operation Sierra Storm, a leading national weather conference, took place Jan. 28-30 in South Lake Tahoe. Fire officials discussed the impacts of an unusually vicious fire season that was devastating to areas like Redding and Paradise. The event was a cutting-edge meteorological forum and seminar for network television meteorologists from around the country. Operation Sierra Storm featured leading scientists and experts discussing newsworthy weather and science topics, and providing ongoing education, networking, and live broadcast opportunities. 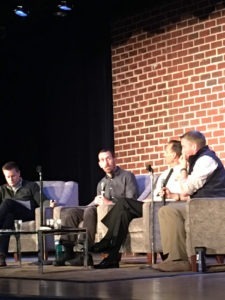 Approximately 100 people attended a roughly three-hour free presentation on the final day of the conference at Harveys Lake Tahoe Cabaret Theater. It was an opportunity to learn about both climate change and wildlife fires. In its 23rd year, Operation Sierra Storm reinforced South Lake Tahoe’s reputation as a leading winter destination and for its environmental concern and responsibility through online, print, digital and TV outlets in major markets. The forum-like event included a discussion regarding what consequences does the recent Intergovernmental Panel on Climate Change Report indicate? It also addressed the impacts on humans and natural systems of additional warming and what are the adaptation and mitigation options for reducing risks over shorter and longer time scales. The Operation Sierra Storm included a round-table discussion with three fire experts, who covered what public and private sectors need to know: historical perspective, fire management and response, impacts of climate change, potential suggestions and solutions. This much has been known for quite some time: without sweeping changes, a snow-less future is coming. To spur changes, state ski trade associations like Ski California have joined with the Outdoor Industry Association, SnowSports Industries America, and National Ski Areas Association to form the Outdoor Business Climate Partnership. The goal is to provide climate change leadership and apply political pressure. Experts believe a dramatic decline in the Sierra Nevada snowpack may take place in Northern California by mid-century, according to a study by the Department of Energy’s Lawrence Berkeley National Laboratory (Berkeley Lab) in December 2018. Those findings were reiterated at Operation Sierra Storm. The Tahoe mountains are modest compared to other larger peaks in the Sierra Nevada. The range that stretches south through Yosemite National Park is much higher than the one in Tahoe and grows to a top height of 14,505 feet at Mt. Whitney. The lower elevation mountains are why Tahoe will probably feel the results of a dwindling snowpack first, according to the Berkeley Lab study. By year 2100, the study says the entire Sierra snowpack will suffer a 79 percent decline. “There are big shifts happening in snow tourism, in all kinds of weather-related tourism,” said Dr. Kristie Ebi, a lead author for a special report for the Intergovernmental Panel on Climate Change. Ebi, one of the conference’s primary speakers on the final day of the forum, said that limiting global warming to 1.5 degrees Celsius (34.7 Fahrenheit) from the pre-industrial era would require unprecedented societal changes. She feels that having an increase to 2 degrees Celsius would result in much greater consequences. 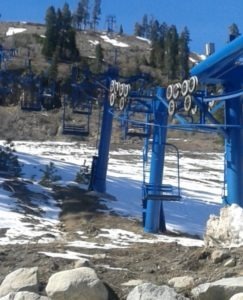 Climate change is having a tremendous impact on Lake Tahoe ski resorts. Snow totals were extremely meager in 2015. Ebi has been conducting research and practice on the health risks of climate variability and change for more than 20 years. She mentioned that polar bears are currently in “deep trouble.” She said more droughts and floods would impact crop yields, and beach areas would become too hot to enjoy. “Climate change is something we definitely have to focus on and make a commitment,” she said. The fire experts showed photos of the devastation that occurred in several Northern California fires, including the Atlas, Tubbs, Carr and Camp fires. They stressed how today’s modern fires are becoming so large, so quickly. The Camp Fire was particularly devastating, quickly destroying the town of Paradise and surrounding areas. The conference was presented by the Lake Tahoe Visitors Authority and Tahoe Douglas Visitors Authority, with support from Heavenly Mountain Resort, Harrah’s, Harveys Lake Tahoe, Edgewood Tahoe, Lake Tahoe Resort Hotel, Hard Rock Hotel & Casino Lake Tahoe, MontBleu Resort Casino & Spa, Tahoe Regional Planning Agency, and Tahoe Fund.